This is the classic ball toss game that you play at carnivals and fairs. Aim for the highest score possible by tossing the balls into holes with different scores. The higher the score, the smaller the hole. Develops focus and spatial reasoning skill sets. 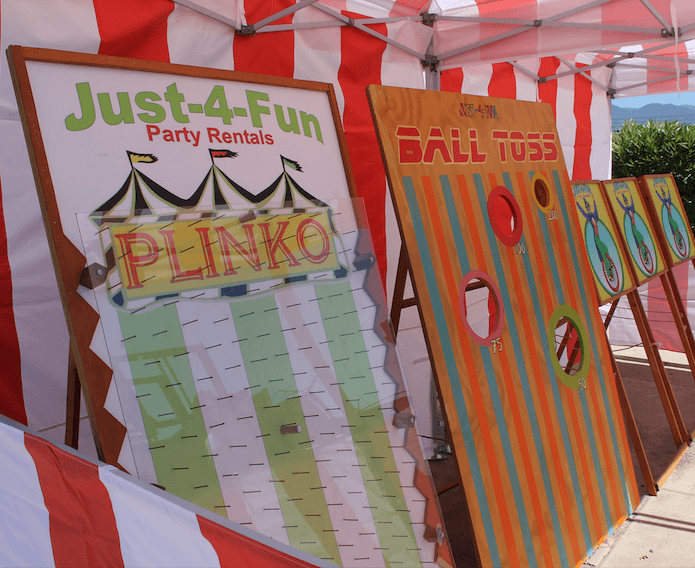 All of our carnival games are hand-crafted and have an old-timey vintage look. Made of wood with colorful and whimsical designs, our carnival games are environmentally friendly and sure to delight. Rent our carnival games for your next party or event. Select from a variety of carnival game fun! Other popular game rentals include: Rubberband & Cork Gun Game, Lolly The Unicorn, Bucket Ball and Rebound. Need help planning your event space? Our Planning Page can help answer space planning questions. Not sure what you need? Let our Pro Tips light the way. Not sure which linen to select, click here for Linen Sizing Guide.